From the title description of this blog written by Milton W.(Bill) Cooper author of the landmark book titled "Behold A Pale Horse" [who had several attempts made on his life resulting in his untimely death] we know that the Illuminati can create earthquakes through use of modern technology, cause economies to collapse, cause wars to erupt, and will even in the future create an extraterrestial landing through advanced technologies to frighten people into giving up their rights. They are also the authors of the environmental movement through their proxies, abortion, removing prayer in public schools, mass shootings through mind control, population reduction(Eugenics) etc. They are the occult global elite steeped in the ways and methods of Satanism. Fritz Springmeier author of "Bloodlines Of The Illuminati" has stated that "the roots of the Illuminati go back to Aryans who conquered Mesopotamia and the Indus valley creating the Mitanni, the Hittites, the Hurians, the Assyrians and Persians." All quotes unless otherwise noted are taken from Fritz Springmeier's book "Bloodlines of the Illuminati" See footnote. "The Aryans gave mankind the oldest sacred scripts, the Vedic literature the Upanishads used today by the Hindus." "Babylon was the center of modern Judaism with its Babylonian Talmud and its Babylonian cabalism. Cabalism also forms the heart of witchcraft and Freemasonry." "The Illuminati beliefs developed many centuries ago by power hungry men who believed that some men were destined to rule over lesser men. The Illuminati are elite bloodlines that are married to the practices of black magic to gain power." "The secret societies of the Illuminati practice occult theocracies that are totally removed from the teachings of Jesus Christ and Gautama Buddha. And yet the leaders of many Buddhist and Christian sects are connected to the Illuminati." "They worship a God of power and evil. Of course they hid their esoteric beliefs from the common people. "(that's you and me) "But the evil power they worship is not simply pure evil, but it was the evil genius who had the ability to masquerade as an angel of light. In other words, their role model was not pure ugly evil, but a being who is capable of carrying out the ultimate Machiavellian deception, the ability practice vile evil while looking like a beautiful angel." Sound familiar? It should, for the bible tells us in II Corinthians 11:14-15: "And no marvel; for Satan himself is transformed into an angel of light. Therefore it is no great thing if his ministers(Illuminati) also be transformed as the ministers of righteousness; whose end shall be according to their works." "The secret worshippers of the Illuminati worship Satan and they are desperate to please their god of evil. What does this god want? They believe that he wants to destroy man. It would appear that Satan is obsessed with the perversion and destruction of mankind." "However mankind chooses to label this full scale war of destruction" which is what it is "the ancient wisdom of the Bible quite accurately describes it as "The wicked walk (prowl) on every side...."(Psalm 12:8)"
We need to be reminded of this so that when a familiar smooth talked pin-striped politician says something appealing we need to be mindful of his ulterior motive because their is a war on to influence how you will think and act. In the last days "if it were possible even the elect" would be deceived. Matthew 24:24, Mark 13:22. We must remember that "this god of Darkness and his worshippers"(Illuminati) "have developed an intricate plan of attack for this war. Many people including Christians, do not recognize that Satan has specific plans" carried out not only spiritually but on the physical plane in which we live. "Not only does Satan have plans, but they are detailed, they are ingenious" (masquerading as an angel of light), and we must not forget that "they are designed for the long haul"(over centuries of time). The Previous article titled THE GATHERING STORM and TEN KINGDOMS(published December 2003 on this website) details some of those plans by The Club of Rome. Remember 1 John 5:19 "And we know that we are of God"(Christians), "and the whole world lieth in wickedness." KJV "We know that we are children of God and that the world around us is under the power and control of the evil one"(Satan). Every Man's Bible. "Satan has the world in his grip and his influence is exerted though his empire" of worshipers(Illuminati). We experience this as what I call corruption en mass, the destruction of everything that is good and just, and the "demonic influences that have permeated this world. But more often both Christians and non-Christians are unaware of how Satan controls the world. Some Christians believe that Satan controls men only through influencing their thoughts." This is indeed true, however they may be "totally unaware that Satan actively works as well on the physical level and has organized his empire" on earth "extremely well." "Because of this lack of understanding of how Satan has organized his realm and transmits orders to his worshippers, Christians" in particular "have been very susceptible to all kinds of deceptions and misrepresentations." "Christ and His disciples warned that Satan's empire was not divided, nor is it now. This realization has not really sunk into most of Christendom." This article is meant to shed some light on how Satan's empire is organized here on earth in the physical plane so that you may not be deceived. "Satan is systematically destroying the Earth through his wicked empire. It is vitally important for God's people to understand how this empire works and what it intends to do to them." "Evil powerful groups of men have organized themselves to perpetuate their powerful bloodlines. This organization was known as the Brotherhood (or the Brotherhood of the Snake). The goal of the Brotherhood was to unite the world by any means, and bring it under Satanic rule. The Brotherhood, and its network of organizations began working throughout history to bring about this Satanic dictatorship. The Brotherhood was dominant in the human affairs of many ancient civilizations, such as the Babylonians, Persians, and Greeks. From these societies occultic religions were cultivated, controlled and encouraged by the Brotherhood. Over time a web of evil control has been spun around the world." "Step by step, the Brotherhood became entrenched in our ancient societies and many Brotherhood members had developed Satanic bloodlines. The members also took control of the world's monetary system, because the devil knows that the love of money is the root of all evil. He knows that he can trap good and decent people with the earth's temporal wealth." "Wealth, intelligence, wisdom, love, divinity, imagination, God--the things men go in search for, are used by those in power to entrap other men." The Brotherhood elite which functioned for thousands of years, found a fanatical man willing to further their evil agenda. His cover name became Adam Weishaupt. He was used to restructure the bloodlines and new recruits into a better organization. On May 1, 1776, after years of indoctrination, the prominent Mason (The Rites of Freemasonry are secret Brotherhood Orders which worship Lucifer at the highest levels) founded a secret Luciferic Order in Ingolstadt, Bavaria (now Germany). The name of the Order was the Illuminati. The Order's name meaning "illumined ones" signified that its members had been initiated into the secret teachings of Lucifer the light bearer and had been enlightened to divinity." Here we see Satan's old lie repeated once again. i.e. that man can become God. The bible says in John 8:44 KJV "Ye are of your father the devil, and the lusts of your father ye will do. He was a murderer from the beginning, and abode not in the truth, because there is no truth in him. When he speaketh a lie, he speaketh of his own: for he is a liar, and the father of it." "Weishaupt was funded by the Satanic Bloodlines of the Brotherhood, he was only a front-man for their ideals. The purpose of the Illuminati was to recruit high ranking Freemasons into a united Brotherhood order. Freemasonry already reflected the agenda of the Brotherhood, but there needed to be a special Order(Illuminati) within the Masonic Order so Satan's empire could be effectively extended. Weishaupt said this about the Illuminati goal. "The true purpose of the Order was to rule the world. To achieve this it was necessary for the Order to destroy all religions, overthrow all government, and abolish all private property." "The only way for the Illuminati to succeed was by remaining confidential. Initiates were therefore sworn to secrecy by taking an oath of silence during their initiation ceremonies. To keep the Illuminati behind its walls of deception, Weishaupt asked his followers to lie in achieving their Satanic goal. He wrote "One must speak sometimes one way and sometimes another... so that, with respect to our true line of thinking, we may be impenetrable." Another means of deception was the use of symbols and pen names. Weishaupt's code name was Spartacus." "The Illuminati was able to attract members by offering immense power and worldly success." "Once Weishaupt's organization was established, the Illuminati began to use any means available to facilitate its destruction of Christianity and civilization. It's members were involved in devil worship and they actively worked to uphold Satan's initiatives. The Order solidified its control over the Masonic lodges of Europe, and became the leaders of the one-world movement." that we see today. Ten years later a sovereign act of God exposed the conspiracy. Lightning struck an Illuminati courier, Lanze, and he was killed. The Bavarian government discovered the plot to overthrow European governments on his person and quickly raided Illuminati headquarters "confiscating the Order's secret documents." "Several members of the Order were prosecuted by the Bavarian government, but most of the members escaped and received asylum by various European leaders." Perhaps "one of the best exposes of the Illuminati is entitled Proofs of a Conspiracy against all Religions and Governments of Europe, carried on in the Secret Meetings of the Free Masons, Illuminati, and Reading Societies" by John Robinson. "...an Association has been formed for the express purpose of rooting out all the religious establishments, and overturning all the existing governments of Europe." He discovered that the leaders would "...rule the world with uncontrollable power, while all the rest...will...employed as mere tools of the ambition of their unknown superiors." "There is no doubt the Illuminati existed. Even its own members recognized its existence. Albert Mackey, a Masonic scholar(and quite likely an Illuminati member) praised the Order in his Encyclopedia of Freemasonry. The original design of the Illuminism was undoubtedly the elevation of the human race. The official magazine of the Supreme Council of 33 degree Masons, called the The New Age, in its September 1933 issue, on page 554 claims the successors of the 18th century Illuminati still guide mankind but that they are now the Great White Brotherhood." "Winston Churchill, the Prime Minister of England during World War II, wrote in a London newspaper in 1920: "From the days of Spartacus-Weishaupt to those of Karl Marx, etc... this world-wide conspiracy for the overthrow of civilization and for the reconstruction of society on the basis of arrested development, of envious malevolence and impossible equality, has been steadily growing." He is talking about Communism and Illuminism as being more than a 140 year old conspiracy to "overthrow civilization." "Thirteen families or bloodlines are at the top of the organization, and five of these families are on the inside core of the thirteen. The Illuminati themselves decided to elevate 13 bloodlines." "The number 13 is extremely important magically." They believe strongly in symbology and numerology that certain numbers such as 13, and symbols such as the pyramid have magical supernatural powers to influence events. "These 13 occult tribes mock the 13 tribes of Israel (remember the 12th tribe, the Tribe of Joseph was split into Ephraim and Manassah.) This does not mean that only 13 Illuminati bloodlines are powerful. There are other families that have risen to prominence; Further, worldwide there are other families of great oligarchical power who have allied themselves to the Illuminati in the political and economic realms without having to intermarry into the Illuminati." "There are 13 families or groups heading up the World Government plan. These families are portrayed as the 13 layers of blocks found on the strange seal on the reverse side of the U.S. dollar bill. In another case, an ex-Illuminati member wrote in a privately distributed article that Satanism was controlled by "a few families". This gave further confirmation that the Illuminati is tribal and oligarchical in nature." "The top 13 families along with the families that are allied with them, are in competition with each other. These top families are united against the common man, whom they fleece regularly and in their own inside documents call "cattle"." [How arrogant and evil!]. The top families compete with each other in their power struggles to see who is best fit to rule." Some of these families by last name are: Astor, Bundy, Collins, Dupont or Du Pont, Freeman, Kennedy, Li, Onassis, Rockefeller, Rothschild, Russell. The 13th bloodline called the Merovingian "considers themselves divine and the descendants of Lucifer." How do the orders of the Illuminati work today and who controls them? "The ruler of this sinister empire is Satan. The Illuminati is his brainchild and the Lord of Corruption directs his kingdom with an iron fist. Did you know that every 28 years the hierarchy of the Illuminati holds a yearlong event called the Feast of the Beast. At this feast, in key locations across the world, Satan himself delivers detailed instructions on how to bring in the New World Order. These instructions are then sent through the empire's chain of command to the foot-soldiers of the conspiracy. The plan is then put into action by the order's many organizations." David Hill says, "The guiding force behind the Illuminati has always been certain demonic spirits assigned to steer the leaders of the society." "The members of the highest level of the Bavarian Illuminati called themselves kings. Today's Illuminati now call themselves Olympians, like the Greek gods. Their hierarchy of top-level Satanic bloodlines is very influential and holds strong authority over the upper levels. These families are practicing Satanists and have a blood thirsty lust for power. Their goal is to enslave the world and hand it over to the Master of Death. (Satan) It is by their orders that modern day atrocities occur." "The upper levels of the Illuminati work in a way that could be compared to a Republican form of government (although we know it is a tyrannical monarchy in which Satan reigns). Top level groups can be classified as Executive, Legislative, and Judicial. The Executive branch would be the Council of 13" spoken of by Barry Smith in his book Final Notice "which directs the New World Order." On this Council are 12 Satanists and 1 Atheist. Underneath the Council of 13 is the legislative Committee of 300. The Committee of 300 is an organization that helps rule the upper levels of Satan's empire. Its 300 members are either representatives of leading family bloodlines in the Illuminati, or men in key positions of power. Each member of the Committee of 300 not only has organizations that directly answer to him personally, but the Committee also jointly runs a number of key organizations. These organizations in turn command many more organizations, and on and on until the chain of command may stretch through five or six organizations. The Judicial branch of the upper level Illuminati would be the Satanic Sanhedrin. 70 leaders reside on this "court" that has existed since Jesus day. Remember Jesus was crucified by the Sanhedrin." There are many other important organizations "that exist within the top levels of the Illuminati. They include the Bilderberg society, the Club of Rome, Tavistock Institute, Fraternal orders, and MI-6. These are controlled by the Satanic Hierarchy and run the operations of lower levels. There are secret meetings of the Illuminati such as the Tiffany Lamp Group." "Another organization of influence is the Pilgrim Society. It is an extremely secretive group. Its members control multitude of different groups." "Organized evil's biggest advantage is disbelief. Many find it hard to believe that something so outrageous and so evil could actually be happening, and cannot comprehend why someone would want to take over the world on Satan's behalf. It doesn't seem real, it's like some sort of crazy Hollywood fantasy. But the documentation is there to prove it, both secularly and Biblically. The elite rulers of this world are part of a Satanic conspiracy to enslave the human race." So next time you hear a politician state that he wants to take away your second amendment right to defend yourself (ban guns) or your right of free speech ask yourself could he/she be a member of the Illuminati? Remember their goal: the destruction of civilization and mankind. Like the mythical phoenix(an occult symbol) pictured at the top of this article which arises from a world torn by chaos which the Illuminati create; a new occult world order will emerge from the flames consisting of 10 kingdoms which will worship the beast (Satan) requiring a mark to buy or sell, or the number of his name. 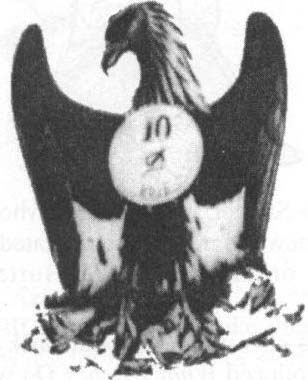 Notice the number 10 written on the phoenix. 1. Fritz Springmeier, Bloodlines of the Illuminati, Third Edition, (Portland, OR: Pentracks Publications LLC), 2007 PP. 1-21.